Here at Plastic Card City we take pride in our customer service and will do all that is necessary to help create the best product for you. If you are not sure about the artwork requirements and the artwork you have on hand, we will gladly review what you have and guide you through the procedure. Plastic Card City now offers a direct artwork uploading system, there is no cost for artwork evaluation! Click Here to obtain an uploading code. Bleed: When artwork (picture or design) have to be printed up to the edge of a card a bleed of 1/8" is needed to insure that the edges look right. A bleed means that the image or design extends out beyond the card edge. 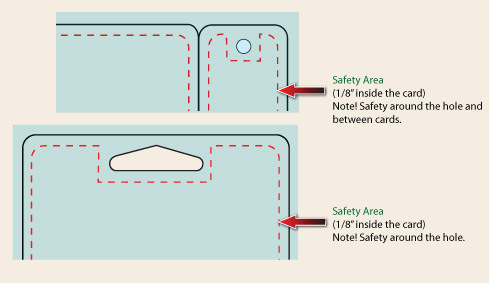 Safety Area: Due to slight variations in card cutting and print shifting a safety area of 1/8" inside the card is required to ensure that all important information (text, logo and images) are not cut off at the edge of a card. We accept artwork in the following formats: PDF (Adobe Acrobat), AI (Adobe Illustrator), PSD (Adobe Photo Shop), INDD (Adobe In Design) and Quark Express. Other formats will be accepted if the artwork is prepared correctly: JPG, TIFF, GIF and BMP. Fonts must be outlined, images must be embedded and at least 300 dpi. When the back of a card is printed in one color the best results are achieved when all the text is created as vector art. Do not mix CMYK and Pantone colors, if you must each Pantone color is considered an additional color and will add to the cost of the printing. Please call for details and pricing. Outline all fonts, embed all images verify that all images are at least 300 dpi. Save in EPS format CS3 or less. Create an image file (JPG), for proofing. Zip all files for Emailing or uploading to our server. Rasterize all fonts, submit with all layers (do not flatten image), 300 dpi minimum. If the back is one color and must be created in Photo Shop leave a duplicate layer of the text un-rasterized and send the font file with the artwork. If you don't know how to do that send the font name, if we have it we will convert the artwork to vector format, if not we will use a similar font or print as an image. For best results create EPS or PDF files. If you are submitting Quark files please "Collect for Output" and include all font and image files. Do not use style command (bold, italic etc. ), use the exact fonts. 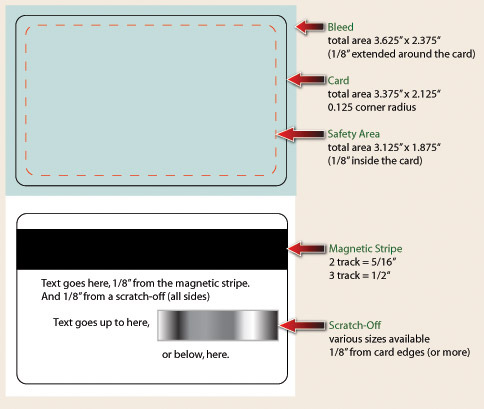 We can print any type of barcode, anywhere, within the safety area, on the card or key tag. To find out what type of barcode you need please download our BARCODE TEST SHEET. Print without resizing and try the different barcode types with your system. Colors on plastic will vary due to differences in the plastics. A slight shift in colors can happen on reprints of the same project in a later time.We do our best to match previous prints but do not guaranty the same results. Exact colors are possible when using Pantone colors on solid or gradient areas of design. We do not recommend mixing full color (CMYK) with Pantone colors due to excess ink costs. Sending Us Your Artwork: Put all your files in a folder and Zip it (or use ant other archiving system). Artwork under 5 meg can be sent via Email, if your artwork file is bigger or you do not want to send it by Email use our uploading system. Click Here for our upload code request page, it will generate and Email to you a link and code that will allow uploading your artwork directly to our servers.